The tropical cyclone OMA-19 was originated on the 12 February 2019 on the Pacific and heading toward Vanuatu and New Caledonia. It became a tropical cyclone Category 2 on the 13 February 2019 according to Vanuatu's Meteorological Service. OMA-19 is currently slowly moving with an east-southeast direction. 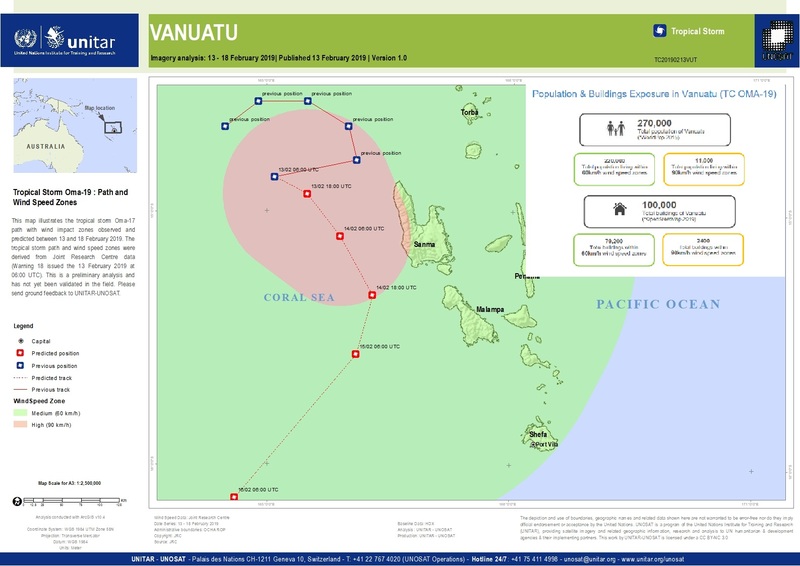 The number of provinces predicted to bear the brunt of Cyclone Oma includes Sanma, Torba,, Penma and Malampa which have been placed on red alert by the National Disaster Office of Vanuatu. The western part of Sanma is expected to experience sustained wind speed more than 90km/h. Based on data of the expected tropical cyclone path OMA, wind speeds zones from Joint Research Centre (Issued on 13 February 2019 06:00 UTC), and population data from WorldPop 2015, UNITAR-UNOSAT conducted a population exposure analysis for Vanuatu. About 4% of population of Vanuatu living inside wind speed zone of 90 km/h and 80% of population of Vanuatu living inside wind speed zone of 60 km/h. 2.5% of buildings in Vanuatu are expected to experience more than 90km/h sustained wind speed.